Formaldehyde, Ammonia and Benzene Molecules on Mars? Would Probably Mean Life. "Speculation is that already methane is a rather strong indicator life is probably present today on Mars. Just simply based on methane. ...Formaldehyde is destroyed in the Martian atmosphere within 7.5 hours. There is no way that formaldehyde can exist and remain for a long time in the Martian atmosphere. If (formaldehyde) confirmed, possibly life on Mars today, yes." The Planetary Fourier Spectrometer (PFS) mounted on the Mars Express spacecraft in orbit around Mars has already confirmed a surprisingly large amount of methane in the Martian atmosphere. See 03/31/04 Earthfiles. If molecules of formaldehyde, benzene and ammonia are also confirmed, it would definitely mean biological life processes are at work on Mars. ESA 2001 Illustration by Medialab. 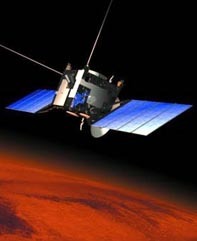 May 6, 2004 Rome, Italy - Back on March 31, 2004, I reported at Earthfiles.com that methane measurements in the Martian atmosphere are being analyzed by Physicist Vittorio Formisano, Ph.D., Principal Investigator of the Planetary Fourier Spectrometer (PFS) which he built and is mounted on the European Space Agency's (ESA) Mars Express Orbiter designed to detect methane and other gaseous molecules. Dr. Formisano is based at the Institute of Physics and Interplanetary Science in Rome, Italy, and has been commuting to ESA offices in Darmstadt, Germany to gather more data from the Planetary Fourier Spectrometer in hopes that he will be able to confirm the location of one or more sources of the Martian methane. In March, he hoped he would be able to make a definitive statement at the European Geophysical Union (EGU) conference on April 26, 2004, in Nice, France.